Summer will be here before long – and with it, the delights of summer garden use. From al fresco dinners and garden parties to quiet lounging in a garden seat, the summer months are when we make the most of our gardens. Many of us choose to have decking installed in our gardens to make using our gardens even more pleasurable. Wood is attractive and hygienic, and provides the perfect base for garden furniture, an outdoor living area, or even an outdoor kitchen. However, winter weather would’ve been tough on your decking. If come spring your deck is looking tired, grey and overgrown with lichen and moss, don’t be disheartened easily. Wood is a resilient material that can easily be brought back to life – with a bit of know-how and the right products. To restore your decking to its former glory, follow these simple spring maintenance tips, developed with the help of professional paint specialists Paint People. This most simple of steps can make a real difference to the condition of your deck; at any rate, washing your deck will help you assess what needs doing next. Begin by sweeping off any debris and dry matter from your deck with a broom and fixing any screws or nails that might be sticking out. Then – proceed to wash it with a pressure washer, which will be much more efficient than washing your deck with a mop. Do be careful not to put the pressure up too high to avoid damaging your wood. Once your deck is dry, you’ll be able to see how much more work is needed, including the condition of the stain or paint coating, and any dirt that is deeply ingrained. The next step is to give your deck a proper clean with a specially formulated solution. The quality of the product really matters here, not only because a good product will clean your deck better, but also because it’ll be better for your whole garden. Another reason for using a high-quality deck cleaner is that it provides a sound base for the paint to adhere to, ensuring a longer lasting finish. Skipping the cleaning step could result in a poor finish, or the paint flaking or peeling. 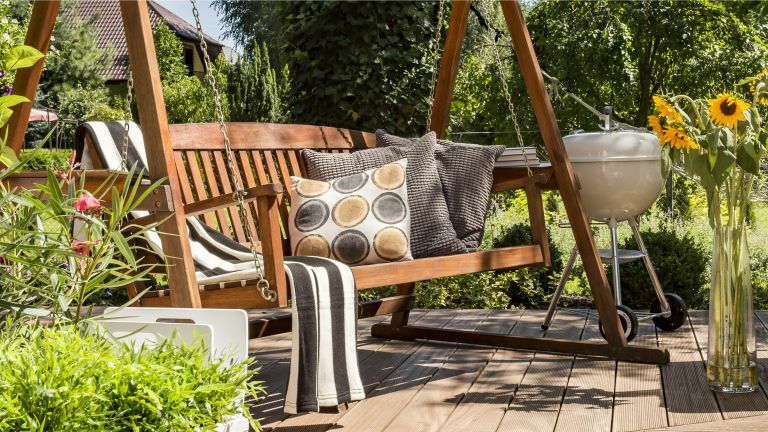 We advise against using all-purpose bleach solutions on your deck – the chemicals are tough on your timber and can also wreak havoc with the ecosystem of your garden. Remember: any chemicals used to clean your deck will get into your garden soil, and any water features you may have. A specially formulated, water-based decking cleaner is much better for your deck and the environment. The Deck Clean by Paint People is fully biodegradable and water-based, and needs only five minutes to work on dirt, algae, and lichen. Coat your dried deck evenly with the cleaner with a stiff broom or push broom. The pushing action is important for really working the solution in and spreading it evenly. Then – wash off and let dry. To really make the most of your deck, the wood must be re-sealed with a coating product such as a decking stain, oil or coating. There are lots of products on the market, but to choose a decking coat that will give you the best result (and value for money), we recommend looking for ‘industrial formulation’ in the product description. The Firmtread Anti Slip Deck Coating by Paint People is a professional formula that has been adapted for domestic use, and combines an attractive finish with industrial-standard durability. The anti-slip aspect will be particularly useful for people who have decking installed next to a swimming pools or water features. It also enhances the safety of your deck during autumn and winter, when the wood gets slippery from rain or ice. For the best-looking result, always choose a coating that is semi-translucent, even if you want to give your wood a new tint. A semi-transparent solution will help create a more natural look, allowing the grain of the wood to show. You’re all set to make the most of the summer on your gorgeously prepped deck. The Deck Cleaner and Deck Coat are available as part of Paint People’s Anti-Slip Decking Paint and Cleaner Kit which also includes a brush.